These Monster Cookies are filled with peanut butter, chocolate chips, oatmeal and M&Ms. This recipe yields cookies that are soft, chewy, full of texture and completely ginormous. Packed with flavor and extra thick – everyone loves this easy monster cookie recipe. 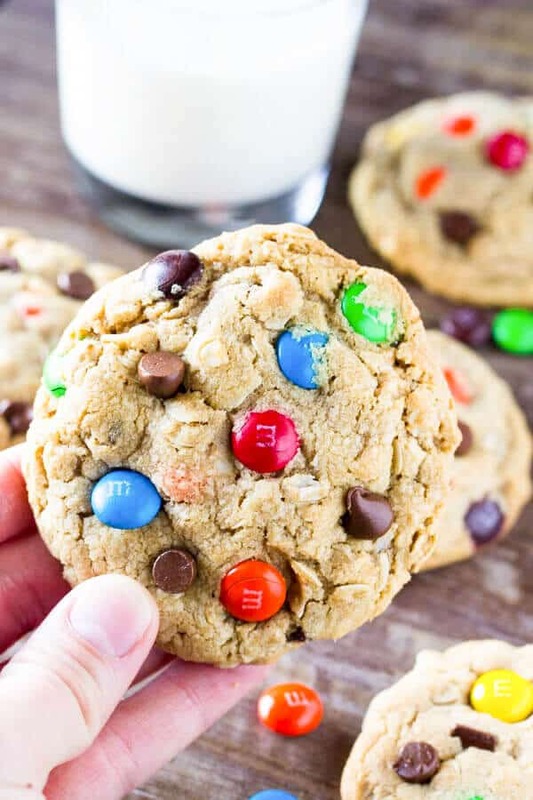 Monster cookies are what you get when you combine oatmeal cookies, peanut butter cookies, and M&M cookies. 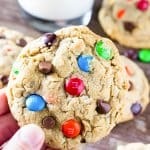 They’re soft and chewy – which gives them a delicious texture – and have the most delicious peanut butter flavor along with tons of chocolate chips and chocolate candies making for one seriously addictive cookie recipe. 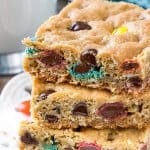 The dough goes from ingredients to cookie dough to fresh out of the oven cookies in no time because for this recipe you don’t need to put the cookie dough in the fridge to chill. First, we beat together the butter, brown sugar and white sugar until fluffy. I like to use a combo of white sugar and brown sugar because the brown sugar adds more flavor and creates chewier cookies. Then we mix in the peanut butter, followed by the vanilla extract and egg. Then it’s time to mix in the dry ingredients: flour, baking soda and salt. It’s very important not to add too much flour or else the cookies can get dry. Before measuring, give the flour a whisk. Then spoon it into your dry measuring cup and level off the top. Then it’s time to mix in the oats. I use large flake oats for this recipe because they add tons of texture and a delicious chew. Last but not least – mix in the chocolate chips and M&Ms. Feel free to use regular M&Ms or the miniature baking M&Ms – both work perfectly. Then form the dough into balls and it’s time to bake. I made large cookies with a cookie scoop that’s about 3 tablespoons in size. If you make these large cookies they’ll bake for 12-14 minutes. Or you could make cookies about 1 – 1.5 tablespoons in size and they’ll bake for 8-10 minutes. 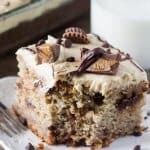 Can I make monster cookies with quick oats? Yes – quick oats will work. However, this recipe was developed using large flake oats – so I recommend large flake or old-fashioned oats for the best results. Do not use instant or steel cut oats, however. Instant oats behave more like flour and make the cookies too dry. Steel cut oats won’t absorb any moisture and stay hard in the cookies. Absolutely. Make the dough and form it into balls. Then pop the dough balls into a freezer bag, remove any excess air, and freeze for up to 2 months. Bake the dough from frozen – they’ll likely take 1-2 extra minutes. These monster cookies are the best combination of peanut butter, chocolate, and soft, chewy cookie goodness. You’ll love how easy the recipe is, and how incredibly delicious these monster cookies are to eat. So pour yourself a big glass of milk, and get ready for delicious cookie goodness. In a large bowl beat the butter, brown sugar and white sugar until fluffy (about 2 minutes). Mix in the peanut butter, followed by the vanilla extract and egg. Turn the mixer to low speed and beat in the flour, baking soda and salt. Form the dough into balls about 3 tablespoons in size (I use a cookie scoop to do this), and place 2 inches apart on the lined cookie sheets. Optionally, place a few extra chocolate chips & candies on top of each cookie. Bake one cookie sheet at a time in the preheated oven for 12-14 minutes or until the tops look just set. Cool on the tray for 5 minutes, then transfer to a wire rack and continue cooling. *Store cookies in an airtight container at room temperature for up to 4 days. Sooooo soft & chewy – exactly how I like my cookies!